Always look on the bright side of life is a cheery little ditty penned by Eric Idle of the oh so very British Monty Python team. So why then don't they? The British that is. Why do they seem to choose the half empty glass over a cup that runneth over? Lest you think I jest, notice if you will just how many British folk end their sentences in "sorry". The telly programs don't help. The most popular are the soap operas, but whereas U.S. soaps feature an abundance of fake eyelashes, glossy lips and designer clothes, British soaps tend toward the carbolic. EastEnders and Coronation Street are two of the longest running. Set amidst the working classes (where rarely anyone seems to work), most of the characters (who all seem to be related) live in gardenless two-up, two-down row houses, whose decor seems to have been inspired by a quick trip to the local car boot sale. Misery rains down on the inhabitants like a toddler's whining -- it never ends. Just as one issue gets resolved, along comes another. But that's the way, the way, they like it. (KC and the Sunshine Band could never have taken off in the U.K. -- far too cheery a sounding name). Sunshine. Ah, maybe there's the rub. Sunshine. Or lack thereof. 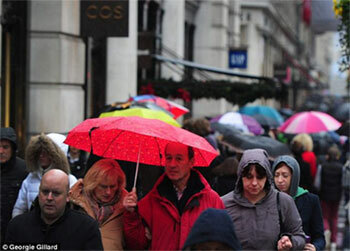 Britain's notoriously poor weather probably has a lot to do with their outlook on life. So frequently does the weather person announce "...with a chance of rain", that telling someone to "have a nice day" is about as foreign a salutation to an Englishman as sweatpants and tennis shoes are to a French woman. Having the weather to grumble about though makes for a good ice-breaker, conversation-wise. There's none of that "hello, how are you doing today?" business we get here in the U.S. Instead, it's all "rotten weather we're having today, don't you think?" or "dreadfully dreary, what?!" A word to the wise; when meeting someone from Britain, make sure you don't enquire after their health. A simple "how are you?" will delay whatever you were doing by at least 20 minutes -- 45 minutes if it's my Uncle Frank on the receiving end of your enquiry and that's just about the state of his feet. Yes, if you're in a rush, or have an aversion to grumblers, avoid talking about the weather, football, the BBC and VAT. Value Added Tax (VAT) is a consumption tax, introduced in 1973, which ranges from 0%-20% depending on the item. Biscuits, a dietry staple in the U.K., for instance are exempt. Unless they are chocolate covered, in which case, they incurr the 20% VAT rate. Chocolate cakes on the other hand are also zero rated. If you think that's a bit nuts, well those too are in the same boat - roasted, shelled and salted nuts fall under the 20% rate, while raw nuts are exempt. "To whom should I complain? ", moans Isabella in Shakespeare's Measure for Measure. And therein lies a problem. Most British people, while they enjoy a good moan, tend not to be very assertive. Making an official complaint would take them out of their comfort zone and doubtless end in the complainer apologising. No, much better to whinge away than to make a scene. Not that I'm complaining mind you. There's nothing I enjoy better than a good old grumble. In fact, conversation falls a bit dead when there's nothing to complain about. If being on the receiving end of an outpouring of whinging isn't your cup of tea, a grumbler is easily identified for they start every sentence with the phrase "mustn't grumble". If a hasty retreat is unavoidable though, bear in mind that the grumbler's goal isn't to elicit change. Whining, whinging, griping, and moaning are a long standing tradition. It's our birthright. We're not looking for solutions. In fact, we find it perectly acceptable to express our disatisfaction at inanimate objects. The newspaper, television or radio, for instance, all make good foils for our grousings. They can't talk back and we can let them know exactly how we feel without ever having to apologise.